The Wessex area covers the traditional county boundaries of: Gloucestershire; Somerset; Dorset; Wiltshire; and Hampshire. It was a super day with some excellent flowers despite the early season. A show report will be published later. Last year I was reporting on summer temperatures, but this year as we all well know it was more like Arctic ones in the run up to the 30th Wessex Group Show. Held at its usual venue in Henton, Somerset, exhibitors had been reporting that they ‘didn’t have much’. Fearing the worst and having visions of empty benches, I even scoured the garden for entries in the more obscure classes, and took the most serious step ever taken in the history of the show, by reducing the bacon roll order. As usual however such claims should have been taken with a pinch of salt as 27 exhibitors produced a great display of blooms. It may have been a bit thinner in the Div3 and multi head classes, but otherwise as good a show as ever. A bit of economy with the bacon and all was well. We even had six new exhibitors in the open classes, which bodes well for the future. 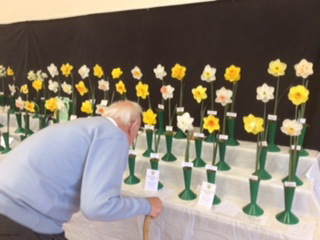 Seven exhibits in the Wessex Championship class requiring 6 vases covering all Divisions 1-4, gave our senior judge this year Janine Doulton from Folkstone, plenty to deliberate on. Ivor Clark took the Championship this year together with the Society Gilt Medal his six cultivars being: Ombersley 1Y-Y; Cherrygardens 2W-GPP; Touchdown 2W-P; Crowndale 4Y-O; Online 2Y-Y; and White Tea 2W-GWW. Second place went to Ray Hayward, and Third was Derek Phillips. Once again however none of the Best Bloom awards were to be found in the top exhibit. 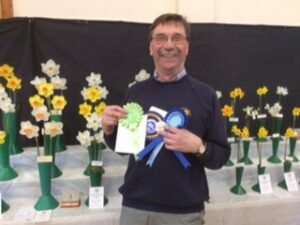 Best Div.1 bloom and Best Bloom in the show was an Ombersley 1Y-Y in Chris Yates’ entry. Best Div.2 bloom was Ray Hayward’s Banker 2Y-O. Best Div.3 bloom was my Truculent 3W-WWY although it was just the best of a poor number of Div 3s and was already drawing its pension. The Society Bronze Medal for the Best Exhibit in Championship classes 2-5, also went to Ivor Clark for his 3×3 Alan Purnell Memorial Class entry of: Snowboard 2W-GWW; Tycoon 3W-WWY; and Queen’s Guard 1W-Y. 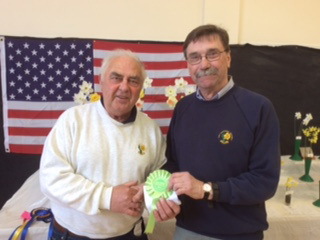 Second in this class was new Wessex exhibitor Rodney Veale, and Third Eric Pickard. The Frank Calcraft Memorial Class for 6 vases from Divs.5-13 was won this year by Evelyn Jane with Boslowick 11aY-O; Avalanche 8W-Y; Quail 7Y-Y; Abbey Road 5WYY-W; Rapture 6Y-Y; and Tracy 6W-W. Second was Jennifer Phillips whose Rapture 6Y-Y in this exhibit was Best Div: 5-13 bloom: and Third was Frank Newbery. The ladies continue to dominate Class 4 for 3×3 Divs. 5-13, Darlene Hayward was awarded Best 5-13 collection winning with: Pipit 7YYW-Y; Abbey Road 5WYY-W; and Quail 7Y-Y. 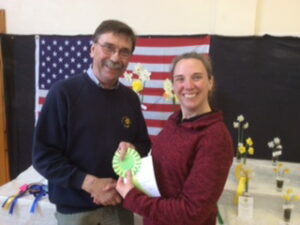 Second was Jennifer Phillips whose vase of 3x Rapture 6Y-Y was awarded Best Vase of three blooms in the show. Third was another new Wessex exhibitor Roz Mizen. Class 5 for 3×3 miniatures was won by Ivor Clark, with Yellow Xit; N.Intermedius; and Angel’s Whisper. 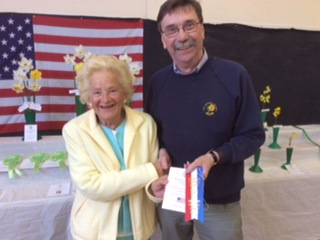 Evelyn Jane was Second and no Third awarded. 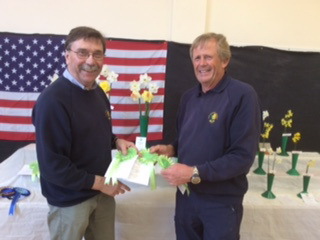 There were only two entries in the American Daffodil Society Ribbon class this year, but both excellent. Chris Yates won this once again with a stunning vase of: Pink Silk 1W-P; Phaonician 2W-W; Trumpet Warrior 1YYW-WWY; Oregon Pioneer 2Y-P; and Miss Primm 2Y-Y. Second was Evelyn Jane. 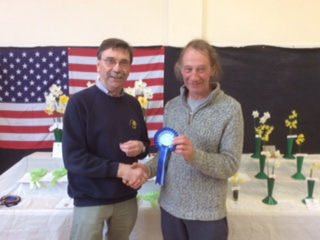 Chris Yates also won the Society Silvered Medal for most points in the show for another great contribution of entries. However Evelyn Jane and Ted Perren were right on his tail in terms of points. There were multiple entries in most of the remaining 46 classes, mostly for single blooms. Amazingly there were over a dozen entries in several of them including classes for 1Y-Y; 1W-W; 2Y-Y; 2Y-O; 2W-P. A couple of Best Blooms were found in this section: Derek Phillip’s Tasgem 4Y-Y Best Div.4 bloom; and a Xit from a vase of three, shown by Ivor Clark and awarded Best Miniature and Reserve Best Bloom in show. 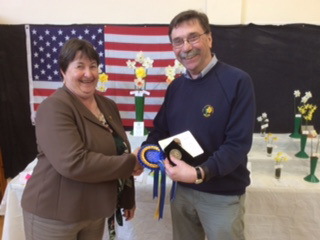 Chris Yates picked up three of the Section Winners rosettes for most wins in:- Div:2, Div:3, and the misc. section. Evelyn Jane for Div.1. Derek Phillips for Div: 4. Terry Miller for Divs:5-13. and Ivor Clark for the miniatures. Our dear friends from Henton GC were there early in the morning and provided the much appreciated Bacon Rolls during staging. The club also provide tea and cakes for visitors to the show, something which our group members do not have the resource to do. Thank you Henton GC and congratulations to Diana Wagstaff winner of Best Exhibit in the Local Classes. 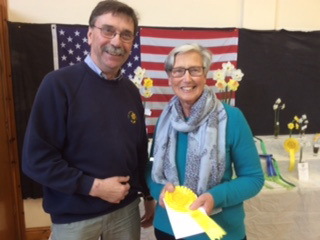 Thanks too, to Janine for travelling so far to judge the show, to Gwynne Davies who once again covered as Show Secretary, and to all my friends, family and exhibitors who unfailingly turn up to put the show up and then clear the hall afterwards. 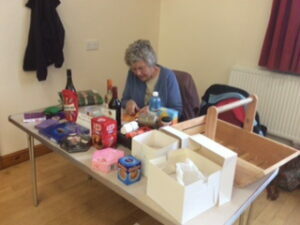 I am truly grateful to you all, and especially to the non exhibitors who troubled to come to Henton only to help. Thank you all. Daffodil items of interest for the Wessex area should be sent to Basil Billinger.